Designing a new living room on a budget? Be inspired by this eclectic Edwardian living room – and check out all our room makeovers for more budget-friendly transformations. The couple initially planned to repaint the living room, but after coming across local interior designer Karen Knox on Houzz, they decided to see what she suggested. ‘I immediately resonated with Karen’s sense of style and was over the moon when I discovered she was based near us in Yorkshire,’ recalls Vanessa. During an initial consultation, the couple mentioned how much they loved geometric designs and warm metallic finishes, and then gave Karen free-rein to come up with a scheme. 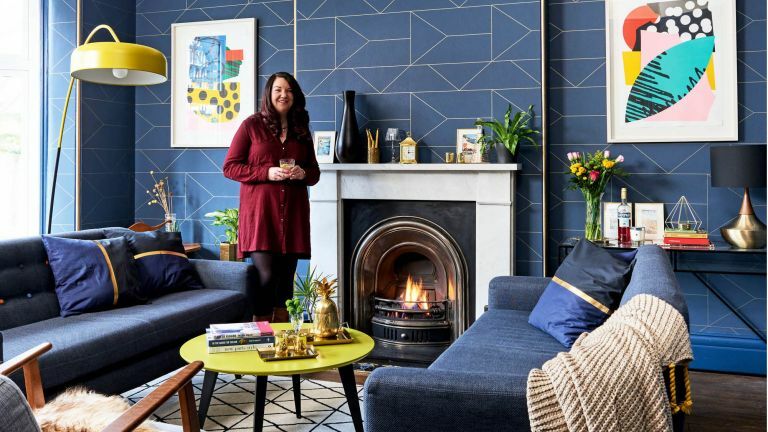 ‘She suggested a beautiful inky blue wallpaper with gold detailing in a geometric pattern, which I loved,’ says Vanessa. Andy and Vanessa did most of the DIY and decorating themselves to cut costs, using YouTube videos as their guide. They even spent the hottest weekend of the summer ripping up their old carpet in preparation to rescue the old floorboards underneath. When it came to furnishing the space, they chose a mix of new, vintage and upcycled pieces, including a bargain £20 sideboard from Ebay, and a Nordium pendant light, which they spray-painted gold. ‘We didn’t set a strict budget, however, we definitely saved money by picking up second-hand finds and mixing them with Ikea pieces and bits we already had,’ adds Vanessa. The couple wanted to spread the cost of the project out in order to make it more affordable, and by purchasing key pieces for the room at the end of each month, they were able to push their budget that little bit further. ‘We were happy to splash out on the wallpaper as it was so special,’ adds Vanessa. The whole room took about five months to complete, with the couple using their weekends to carry out much of the work. ‘It wasn’t too disruptive as we had the rest of the house, but we made sure to take a weekend off every month,’ Vanessa explains. Looking for more living room inspiration?